Lately, I have lent my old car, a beaten up Suzuki Samurai from the end of the last century, to a couple of Airbnb guests. I have always been into sharing what I have, be it on Couchsurfing or Freecycle or just with random strangers. I am in a remote location and public transportation is not ideal, so it was kind of necessary to ensure guests remained happy. And now that I have two cars, it is not such a big deal. The first person stayed at my place for a week, and used the car heavily. I didn’t charge him a penny, so was at least expecting a clean car and full tank in return. He gave it back with “a little more gas than when (he) got it” (which was a lie, there was less) and dirtier than when I last saw it, with beer and soda cans on the floor, plastic wraps, etc. Instead of a thank you, I got a “by the way, this and this is not working”. Which he could have gotten fixed for $7 as a thank you. Yes, mechanics in Guatemala are that cheap. I was so bitter that I never wanted to lend my car again. So when that other person had problem with his vehicle and there was no other choice, I offered my car, but asked that he put $30 more gas than whatever was in the car, as a “rental fee”. When that person came back, he had put about $45 worth of extra gas, cleaned the car, and got me a jar of jam “to say thanks for lending (him) the car”. I was really pleased and my faith in humanity was restored. Two people, one car, two opposite reactions. Guess who got a free ride back to town the next day at 5am, and a smiling host catering to their every needs? Nice guy, of course. I was so surprised that in spite of me putting a $30 rental fee that was almost as much as Hertz, the person felt so grateful they had to get me some gourmet jam, while the abusive guy could use the car for one week and almost complain it was not good enough for him, that I tried to gave back some of the kindness I had received from the former. Even though we were technically even, he went above and beyond to say thank you, and I wanted to do more to say thanks for the kindness. Good things snowball. When you treat people well, they treat you well too. I mean in this case I have to treat both guests as guests but the nice one got extra kindness. And sometimes, it is really hard to find gratitude in your heart, because the person is being harsh with you, but if you are harsh in return, you’ll only get that person to close up more, and get angrier at you. If you reply with kindness, you may surprise them, and have them be nice to you instead. I remember being very frustrated with a needy person recently. Something that seemed very trivial to me was proving difficult to her, and she was almost asking that I hold her hand all the way. I was getting frustrated and answering dryly. Then the person said I was wonderful for being so patient, apologized for her neediness and threw back another compliment. When all I deserved was that she yelled back at me and demanded to be treated better. I was so surprised by those praises and compliments that I felt less frustrated and found more patience to finish helping her. Kindness doesn’t mean monetary retribution for a favor, it mean acknowledging the effort the other person is doing to help you, serve you, care for you… and at least give back a heartfelt thank you and a few nice words about how your life was made better thanks to them. You don’t have to do it, and if you don’t, nothing will happen, but if you do, the good things will keep on coming. What do you think? 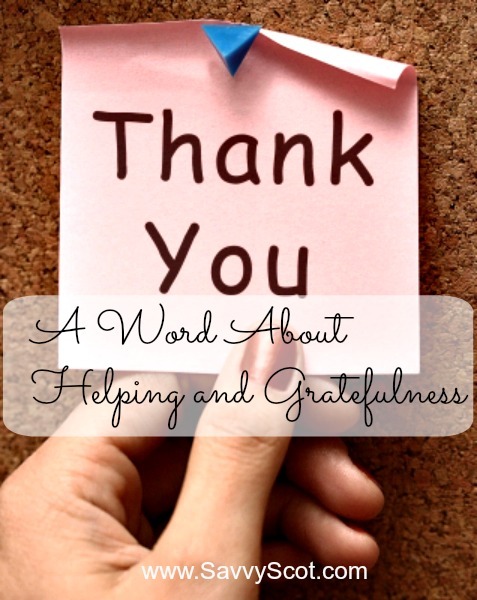 Are you extra kind when people show gratitude towards you? Will you remember to gas up your friend’s car next time you borrow it :)? Sorry that happened. But I am definitely jealous how cheap your mechanics are! haha! People make about $10 a day here so 4 hours worth of mechanic rarely end up over $15. That is so true things can go very wrong just because you feel bad about a first half bad comment and come back with a worse one. I had a client who was a bit needy with technical support and I used to be very dry, he was always kind and praising me for helping him. Now we are close friends, when he could have sent me to hell and taken his business elsewhere.